While working on an upcoming project, I went looking for a post to link that detailed my testing and review process, and I realized I didn't really have one. Whoops! 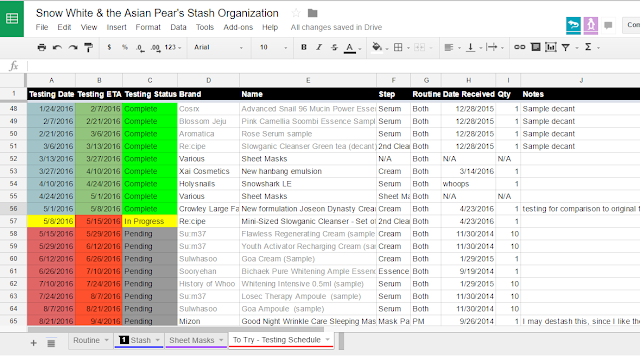 I do have a pretty in-depth post about my spreadsheet which focuses on how my stash is organized and how the testing schedule works, but I don't really have a stand-alone post about the testing process despite being pretty passionate about it ... so here we go! An automated testing schedule is a lovely thing. While this post is intended to offer people a behind-the-scenes look into my process because I'm really keen about transparency and sharing my nerdy testing schedule with people, it's also going to be beneficial to anyone who's keen on a multi-step Asian skincare routine. I'm going to start with why testing, and specifically what I call "isolation" testing, is important for anyone, whether you're a user of skincare or a reviewer of skincare. It's even more important for the latter, but I firmly believe that everyone should do it. Simply put, it's testing only one new product at a time, spaced minimum 2 weeks apart. ** As a reviewer, I need to be able to confidently point to a specific product when I'm either crediting it with a positive change, or damning it as the instigator of a negative reaction. As a user, if you are applying multiple new products at once, if you have a reaction (irritation, rash, breakout, or worse) you aren't going to know which product caused it. It's hard not to throw all your new goodies onto your face, believe me I get it. But if you don't space them out, you could end up incorrectly blaming the wrong product for causing a reaction, or throwing out everything because you don't know what the culprit is. But what if you want to try them allllll?! Isolation testing will also help you figure out your skincare triggers, which is a milestone that every skincare nerd strives for in an effort to waste less money buying dud products. Check out these posts by adoredee and Fifty Shades of Snail for more on figuring out your personal triggers. My nemesis is chemical sunscreens, which is why I only use physical UV filter sunscreens. **The two week rule of thumb has a few exceptions, and I'll get into those in this next section. The reason I don't isolation test cleansers for more than a week is: 1. I don't expect them to have any positive, lingering effect on my skin and 2. their only job is to clean effectively without causing any problems. A week is enough for me to notice any reaction breakouts, clogs from ineffective cleansing, and textural differences if it's stripping or irritating my skin. Actives, on the other hand, will bring your skin to Snesus, kicking and screaming while spitting out clogs and disgorging forth horrendous purge-induced breakouts. I like to give them a very, very healthy adjustment period with my skin before I add in another type of active, in order to avoid over-exfoliating my skin. This is 5 months of testing right here. However, since I've been using actives for a long time and I'm long past the initial purging period, that wouldn't stop me from introducing, say, a cream after 2 weeks of adding an active, as it won't put me at risk of over-exfoliating my skin. That being said, if my skin was actively purging, it would be smart to avoid introducing anything new until I can be confident that any new breakouts were the cream, and not lingering purging. After I isolation test them, I use products for at least 4 weeks before I review it, or until the product is empty- whichever comes first. Sometimes I will purchase an use multiple bottles of a product before I feel confident in my opinion of it- some products (especially those which fade hyperpigmentation) can take months to show results. After reading on Skin and Tonic's blog that skin takes 28 days to renew itself, it solidified my gut feeling that a month's worth of usage was enough time for me to generate a solid conclusion about something and still allow me to cater to my skin's needs. If it's a cleanser or a pH-dependent active, it's getting pH tested before it gets anywhere near my face, for reasons you can read about here: Why the pH of Your Cleanser Matters, and here: Putting your products in order, including pH dependent acids. I use these pH strips from Amazon or these ones from the same company, because the 4 indicator square types are more accurate than the single-colour type, and because they have a 0-14 range which allows me to test down into the range for acids like L-AA vitamin C and BHA. Sometimes, if I really hate a product or really love it, I might be ready to review it in less time, but those are exceptions. I will occasionally test things on opposite sides of my face if I'm trying to compare them, which is how I discovered that my face really hated Cosrx's pH-adjusting toner. As a reader, I was often very frustrated over the lack of thoroughly tested product reviews; I did not (and still do not) think that a few uses of skincare was enough for someone to write a trustworthy positive review of a product. That was one of the catalysts for me to start blogging, and it's something that has stayed with me ever since. Negative reviews, however, are a totally different story! As Snailcaster Tracy of Fanserviced-b recently posted, life is too short for bad skincare. Ayyyy, finally we can talk about spreadsheets! One of my favourite things. You'd think that all these guidelines for spacing things out for testing would be hellish to keep track of, but it's a breeze because of my very nerdy spreadsheet that does it all for me. My testing schedule is the last tab on my stash spreadsheet, which you can view here. Today's the day I begin a new product to test, wooooo! 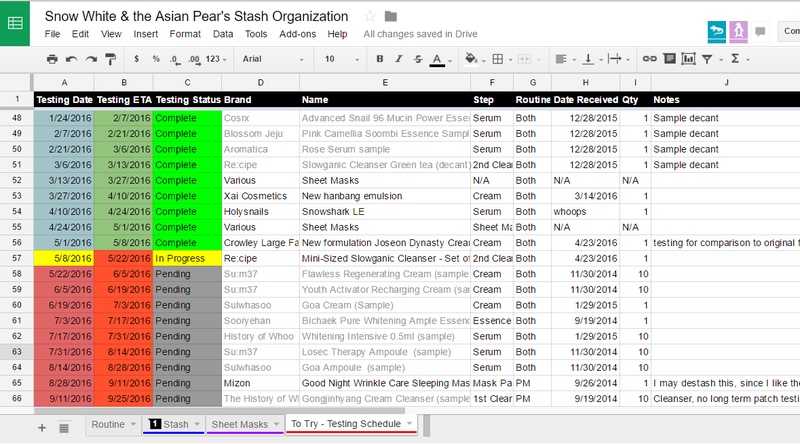 My spreadsheet, by default, calculates the start date of a new product to test with two weeks between them. It also has a series of fancy conditional formatting to flag if it's time for me to start something new (as it did on the day I wrote this post) and it's flexible-- if I stop using a product early because I hate it, I can just enter the date I stopped testing it and blam! It auto-calculates all the new start and stop dates for all dates in the future. Now I have an adjusted forecast of time slots for future products, without any further effort on my part. Huzzah! Also, if I don't want to start testing what I have planned next, I just drag and drop what I have on the list as I need to, giving me me flexibility to be as flighty as I want about what I'm going to put on my face next. For example, I keep bumping down the Illi Cleansing Water that I have pending to test because I haven't finished my bottle of Su:m37 Cleansing Water yet. I don't like having too many of the same kind of product open at one time (you read more here: K-Beauty & Portion Control: Why Sometimes Good Value Can Be a Bad Idea), so that also factors into what I test next. If you would like to use a copy of my sheet for personal, non-commercial use, that's fine (you can find instructions on how to do so here) but please link back to my actual blog post about it if you post about it somewhere and you used my sheet as your starting point or copied portions of it. I keep my spreadsheet publicly viewable because I like to share my enthusiasm for nerdy things with others, and because I like the idea of people being able to see what I'm up to. Are you a spreadsheet nerd who tracks their skincare too? Hit me up on Facebook or Twitter and let me know! Wow, I love your nerdy testing schedule. And to think there are still some beauty bloggers who test out products by wiping them once on the back of their hands. I don't like those people. Agreed, unless it's a product that can be measured objectively (like makeup, or one-time-use items) I can't see how it's possible to give an in-depth review without seeing how the product performs. While I don't test as long as you do before reviewing, I still wait a week or two generally because I'm using it consistently. Great post! Always a good idea to keep them apart for sure! Hi Cat ! I've read that for acne-prone skin, chemical exfoliation works better than physical exfoliation as physical ones tend to further damage the already-visible-bumps-of-acne on your face. I had an issue with comedones and wanna try chemical exfoliation. May i ask you on what shall i try 1st? I'm not asking for product recommendation but more on to what type of stuffs should i try? As in should it be low pH toner 1st or straight to the powerful actives etc. Thanks ! Although I can't recommend a product or even an approach for you, I recently re-introduced acids into my routine to help with CCs that were cropping up. I started with BHA, and then introduced AHA a few times a month. A pH adjusting toner is less of a concern, in my opinion, unless you use weak acids like I do. It's really going to depend on the products you use. I use a pH adjusting toner every day because my skin suffers without it, but that's just my skin. Just a small question: Do I have to test a sheet mask every other day to "separate" the result of it, or can I test a different sheet mask every day? (Because it is hot where I live, and I want a sheet mask on everyday, AND I have a lot of different/untested masks). Thank you very much! I like to introduce sheet masks far enough away from introducing a new product that I'm confident any reactions are in fact the mask and not something else. Sometimes I'll give myself a break in my testing schedule to try out new masks, and then stick with things I know and love when I'm introducing new products. After testing a new product to find that it clogs your pores/breaks you out, how long do you give your skin to normalize before testing another product? Is there anything that you would do in particular (besides immediately ceasing usage of the product) when you find out that a product is breaking you out and you need to normalize? Thank you! How long do you wait between introducing makeup products?